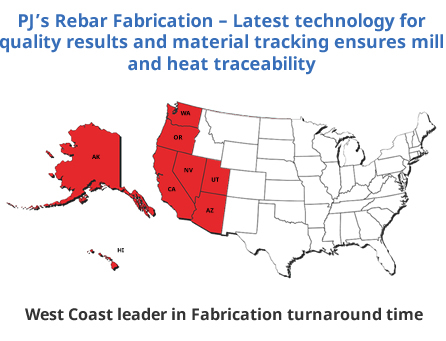 If your project requires a high number of cut-to-length rebar sections, our coil rebar fabrication service will save you time and money. PJ's Rebar uses precision cutting equipment to produce rebar sections in the length(s) our customers need. Unless the length of the sections you need adds up to the exact length of the bar, cutting “traditional” long stock rebar to length often results in significant material waste. By cutting our customers’ rebar sections from coil, we can fill the order using only the actual amount required. This minimizes scrap and reduces material costs, resulting in lower overall prices for our customers. Our coil rebar sections are available in sizes from #3 through #6 and in any length you require. All our coil rebar is dual-grade A-615/A-706 material, which combines the strength and other physical characteristics of Grade 60 rebar with the easy weldability of A-706 rebar. We also offer a range of other rebar fabrication services, as well as preassembled rebar structures such as cages, beams, walls, footings, and more. Request a price quote on coil rebar cutting and fabrication, or contact PJ's Rebar for more information.